An exciting development in our house over the last couple of weeks or so has been Fiona's first solid foods. We waited a little longer with her than is average (she was right at eight months). This was mostly because she wasn't showing any interest until close to the end of October and I didn't want to push her into it. 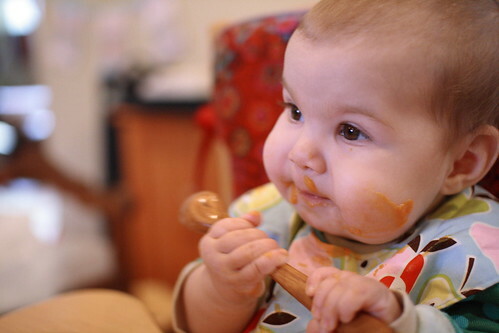 Current recommendations for beginning solids with breastfed babies can be found here. 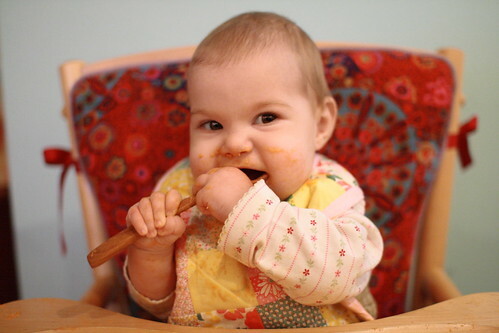 Just like her older sister and brother, Fiona's first solid food was sweet potatoes, which she gobbled right up! We've quickly moved to other fruits and vegetables. We've been getting lots of use out of the bibs that were gifted to us -- the ones you see in this post were made by my friend Laura and by Erin. And this little ladybug bowl was a baby gift from Melissa, and it's one of my favorite things ever. We give Fiona all of her meals using it. 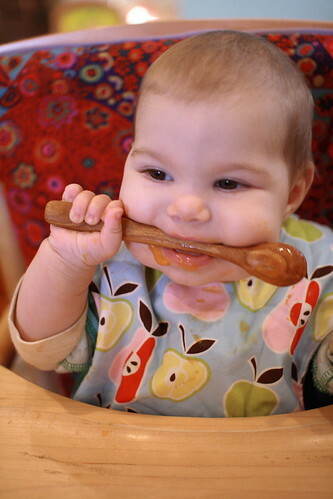 I make all my own baby food, and use a combination of sources for information on feeding solids. My two favorites are Whole Foods for Babies and Toddlers and Super Baby Food. Whole Foods for Babies and Toddlers is a bit more laid back, but has helpful information about incorporating solid foods into baby's day without replacing breastmilk (which should be the primary source of nutrition for the first 12 months of life). It also has some of our favorite recipes, including our go-to birthday cake recipe. Super Baby Food is more of a regimen. It's perfect for Type A mamas who need some real structure to follow. I followed it almost to the letter when Elisabeth was a baby, and I've referred to it often since then, although as I've gotten to be a more experienced (and relaxed) mama, I don't feel like I need such a strict regimen anymore. Just FYI, the information in there about the age to begin solids is a bit outdated and the breastfeeding advice in it isn't too great, but otherwise, it's been a really good resource. 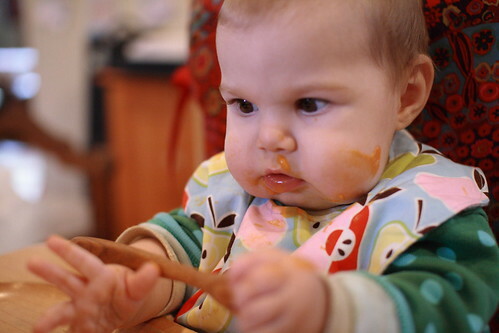 Anyway, what fun to share a love of eating good food with our littlest one. We're all looking forward to many, many happy family meals to come!